“Light” was my word for 2014. It’s an ideal word to guide you when you love to make photographs. And it has moved me in directions I’m very glad to have explored. But there is so much more to the word than that. When times are dark, we all look for light. As we approach the winter solstice, I leave you with a meditation by a favourite poet, Mary Oliver. Beautiful image, Sherry – love it! Here’s wishing you all the best for the holiday season, and a happy new year. I look forward to the light you’ll continue to bring to us through your photos and posts. 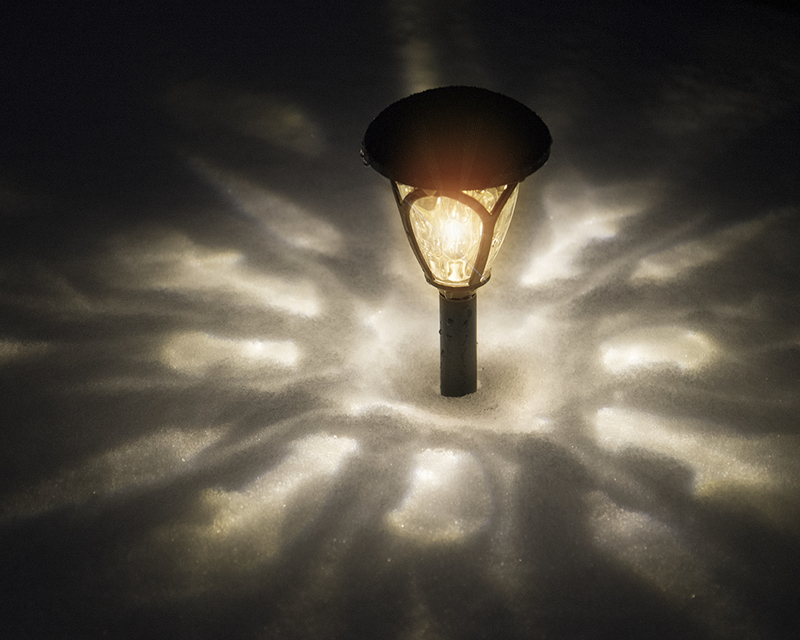 Perfectly lovely facets around the light, in the snow. Wishing you a Merry Christmas, and Happy New Year! Wishing you a very Merry Christmas, and a bright and beautiful New Year, Sherry. I love how the light and shadow create a snowflake pattern in your image. You have such a wonderful eye and your images are always filled with beautiful light, my friend! And Mary Oliver’s words always shine. Wishing you and yours, a wonderful light filled holiday season! As for myself…because your words are still in my head…I’m committing to making my writing more of a priority along with my photos…I think I have found myself again..I was wandering for awhile…but I feel the need to get back outside…thank you for being a leader of sorts..
Lovely photo and I love Mary Oliver. Beautiful pairing of your luminous image with the poetry of Mary Oliver! Have a wonderful holiday season, Sherry! What an awesome image, only you could do as far as I am concerned. It is just like the lamp post is floating on a cloud, you always amaze me with your photography and glad we are on the journey together. Looking forward to seeing some beautiful turquoise water in 2015. Happy Holidays Sherry. Such a lovely lamp creating patterns of light. I like the unusual poem by Mary Oliver. Yes, light is so important as we always seek it out in our darkest moments – and we always find it somehow shining in unexpected places. I fell in love with this photo when I saw it on FB. Absolutely stunning. And such thoughts to ponder in the poem you’ve shared. Wishing you a joyous Christmas, Sherry!